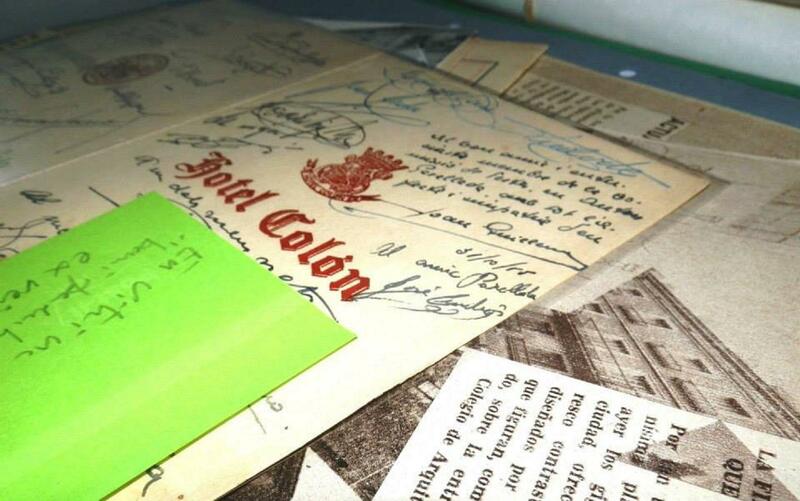 The document archive of the Feast Association of Plaça Nova – Feast Committee of Sant Roc (AFPN Archive), after several traumatic circumstances that the neighborhood of the Cathedral has suffered over the last eighty years and its many years without a stable location of the entity, is in the process of classification and documentation. The material deposited and already classified in the site of the association in La Casa dels Entremesos, collects different historical and administrative documents, designs, original drawings, photographs, press clippings, magazines, posters and programs, books, sound and audiovisual recordings, among others, which have been stored for thirty years in various sites of the Association, in homes of former members of the Feast Committee and other materials donated by neighbors and former neighbors. The Archive Committee of the AFPN, besides taking care of the process of documentation, classification and archiving of the material that is deposited, is immersed in the process of researching, locating and collecting the rest of the historic archive of the organization that is still dispersed, missing or placed in other archives and without a clear reference. Currently the document archive of the Feast Association of Plaça Nova – Feast Committee of Sant Roc (AFPN Archive), located in La Casa dels Entremesos, contains the documentation of the organization of the Feast of Sant Roc of Barcelona at plaça Nova, the oldest in the city, and documentation about this and about various sections and groups of popular culture that form part of the Association. The oldest document is a “joy” dated from 1794. The Archive consists of administrative documents: books of accounts and events; correspondence, designs, programs and posters of festivities; photographic archive (1884 – 2015), sheet music, “joys”, prints, drawings, paintings, drawings and designs by Antoni de Paula Rigau i Tolosa and by other contributors to the feast, press clippings (1910 – 1975) and a small sound and audiovisual archive. It also has collections of publications, complete as Destino and partial as La Família, Folklore or Cavall fort, a small library specializing in popular and traditional culture of some three hundred volumes and multiple copies of books published by the Association and written by members of the Feast Committee: “El meu barri” by Francesc Puig i Alfonso, “600 anys de plaça Nova” by Josep Maria Garrut and “Cent anys dels Gegants de Sant Roc (o vells) de la plaça Nova” and “4 ¼ . 425 anys de Festes de Sant Roc de Barcelona” by Xavier Cordomí.